I slipped up big time! I “THINK” I may have overloaded my brain. You see, today is my birthday—the big 59 (and forever holding, right here!) and a boxed set release day with one of my “oldie but goodie” stories in it. And it’s also my blog day here at Sweethearts. Sorry to be so late, but without further ado, here’s my big news! I will give away a Kindle copy of this boxed set to ONE LUCKY WINNER! Just leave a comment about what got you started reading romance books and be sure to leave your contact info in the comment section, as well! You just might be my winner! Are you ready for FIVE books in one of the best western historical romance boxed sets to debut this year? Prairie Rose Publications has got just the stories you’ve been craving! Get ready for some wonderful hours of pleasure-filled reading as you settle back in your easy chair and get lost in these wonderful tales of romance that you won’t be able to get enough of! Brandon Gabriel is hired by the citizens of Spring Branch to hunt down the notorious Clayton Gang, never suspecting a double-cross. 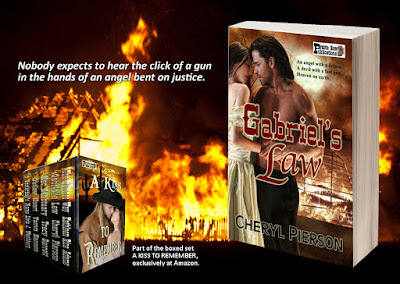 When Allison Taylor rides into town for supplies, she doesn't expect to be sickened by the sight of a man being beaten to death by a mob—a man she recognizes from her past. Spring Branch's upstanding citizens gather round to see a murder, but everything changes with the click of a gun—and GABRIEL’S LAW. The link is "live" at Amazon, if you want to pop over and pick this great collection up for only .99! Don’t you love hearing about strong, successful women who shaped the West? Let me tell you about one who became called The Cattle Queen of Texas and who was a teacher, author, and business woman. Her name was Elizabeth “Lizzie” Johnson Williams. 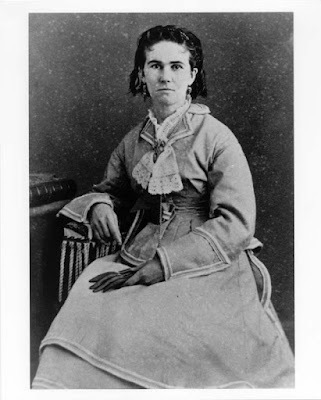 Lizzie Johnson was born in Jefferson City, Missouri on May 9, 1840 to Catherine (Hyde) and Thomas Jefferson Johnson, who were both educators. In 1846, the family moved to Huntsville, Texas. In 1852, her father founded the Johnson Institute on Bear Creek in Hays County about sixteen miles southwest of Austin. Students called Thomas "Old Bristle Top" because of his unruly hair and called his wife "Aunt Caty". All six of the Johnson children attended the Institute, and then Lizzie also attended Chappell Hill Female Institute in Washington County, Texas. When she graduated, she joined the staff of the Johnson Institute, teaching basic subjects and bookkeeping. In 1863, Lizzie left her family’s Institute and taught in various Texas schools before she ended up in Lockhart. In that town, she started a business bookkeeping for cattlemen, thereby learning much about the cattle business. When she moved on to Austin to establish her own primary school, she continued keeping books for ranchers. Lizzie was intelligent with a vivid imagination and began to dabble in writing stories. No one would buy fiction written by a woman, so she wrote anonymously for Frank Leslie’s Illustrated Weekly and Frank Leslie’s Magazine. According to Carmen Goldthwaite, Lizzie’s stories reportedly included “The Sister’s Secret”, “The Haunted House Among The Mountains”, and “Lady Inez: or, The Passion Flower, an American Romance”. Since she wrote anonymously, no one knows how many or which other stories she had published. Working three jobs, she saved $2500, which she invested in the Evans, Snyder, and Bewell Cattle Company of Chicago. Three years later, she sold her interest for an astounding $20,000. Lizzie registered her CY brand in Travis County and began buying cattle and land. In 1873, the glut of beef and the economic downturn resulted in many ranchers contracting with a stock driver to take the cattle north for sale. At first, Lizzie did also. In 1879, she met and married a retired Baptist minister, Hezekiah “Hez” Williams. He was a tall, charming widower with several children and he drank and gambled. Here’s another first for the time. Before Lizzie married him on June 8, 1879 in a Presbyterian ceremony, she had him sign what is believed to be Texas’ first prenuptial agreement. She retained rights to all her property brought into the marriage. (When I used this in my now permafree book BRAZOS BRIDE, now with an audio version available, many people thought that anachronistic, but that book takes place in this era.) At that time in Texas, when a woman married, all her property came under control of her husband, who could sell it and keep the money without benefit to her. Lizzie was a spiritual woman who read scriptures daily. Hez drank, but not in her presence. Reportedly, they had a great deal of respect for one another. She was far better in business and kept careful tally of their herds, insuring that she received the money for her cattle and he for his. On occasion, she loaned him money, but insisted he repay her. Eventually, he yielded his operation to her. The two were very competitive. One ranch hand who worked for them recounted the story of competing instructions. Lizzie would tell him to brand all Hez’s calves with her brand and Hez told him to brand all of Lizzie’s calves with his brand. The cowboy was kept busy following these instructions. Lizzie’s life revolved around cattle, real estate, and investments. She was good at all three. Soon she and Hez were living the good life. In addition to their ranch at Driftwood, they owned a home in Austin. Lizzie was one of the first women to go on a cattle drive. The hardy Texas cattle were immune to the ticks that caused serious illness in Hereford cattle raised further north. When tick fever made Texas cattle unwelcome in Oklahoma and Kansas in the 1880s, Lizzie took her cattle and Hez's up the Chisholm Trail. Eventually, she and Hez followed their herd up the Chisolm trail in a buggy. Other ranchers trusted Lizzie to keep careful tally of the “community herd” driven north. When driving north became impossible due to barbed wire, quarantines, and arrival of the railroad about 1890, she began shipping beef from Indianola and Galveston to Cuba. She and Hez traveled to Cuba, where he was kidnapped. She paid the $50,000 ransom. Those who knew them joked that Hez kidnapped himself to get a little spending money of his own. With their increased wealth, the couple was able to travel, always staying in the finest hotels. Lizzie became interested in silks and satins, jewelry, and accessories. Reportedly, on one trip to Manhattan, Lizzie spent $10,000 on jewelry. Lizzie, now in her seventies, continued to manage her businesses. Without her gregarious and charming husband, she became a recluse who was known as miserly. About six months before her death, a niece took Lizzie into her home when the niece determined Lizzie had dementia. Elizabeth Johnson Williams died on January 5, 1924 without a will and was buried in Austin’s Oakwood Cemetery beside Hezekiah. Because she had appeared to Austinites as impoverished, they were surprised to learn she had amassed a fortune worth a quarter of a million dollars. Lizzie had a strict policy of no loans to family or friends and had told no one where all her funds were. She was so eccentric, she had hidden money and jewels in all sorts of places in her home—in wallboards, floors, cabinets, basement, and crevices. Though unconventional, this amazing woman achieved major accomplishments. 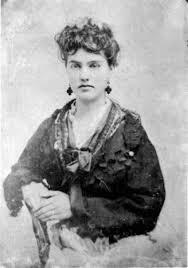 She was one of the first women to drive her cattle up the Chisholm Trail, which resulted in her nickname as The Cattle Queen of Texas; she had the first prenuptial agreement in Texas; and she was a pioneer in breaking the barrier into what had always been a man’s world: cattle trading. Is it any wonder she was the Cowgirl Hall of Fame honoree in 2013? 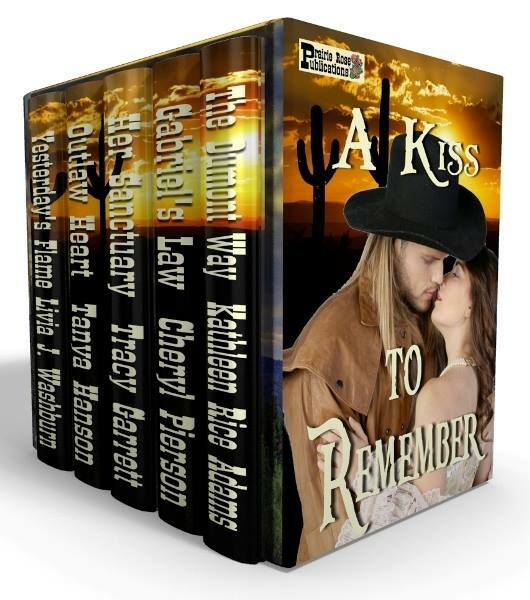 Caroline Clemmons writes historical and contemporary western romance. Her latest is THE RANCHER AND THE SHEPHERDESS, a Montana Sky Kindle World novel being released from Amazon on July 27, 2016. Check her Amazon Author Page here for all her books. For a free novella, subscribe to her newsletter. I think I’ve seen every episode of the long running TV show, The Virginian, but that doesn’t stop me from watching them again when my husband clicks in on. Even if I’m deep into a book, either reading or writing, that show has the ability to pull me out and engage me in what’s happening in Medicine Bow. The TV series is but one adaptation to the original book written in 1902 by Owen Wister. Several movies were also created based on this book that has been credited as being the first true western ever written and the one that created the genre made famous by Louis L’Amour and Zane Grey. In my office, I have boxes of Louis L’Amour and few Zane Grey novels that had been my grandfather’s and then my mother’s. I’ve read many of them, but in truth, they are getting too fragile, but I’m not ready to be parted from them yet. I’ve also read The Virginian. 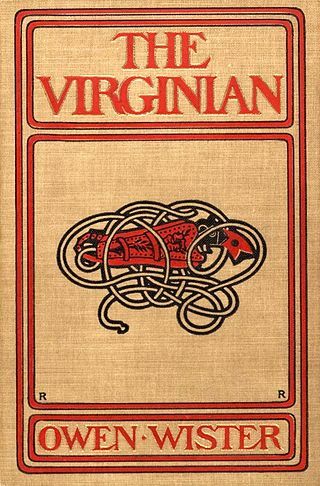 I found the concept of the 1st person narrator who details the story of a man who is only referred to as the Virginian interesting and unique. No real name is ever mentioned. One of my favorite characters in the TV series is Trampas. (I appreciated the cameo of Doug McClure in the popular 1994 Maverick movie starring Mel Gibson. McClure died just a year later.) In the book, Trampas is the Virginian’s foe. The book also has the Virginian ‘getting the girl’, a young school teacher named Molly Stark Wood, and has an happily ever after ending. 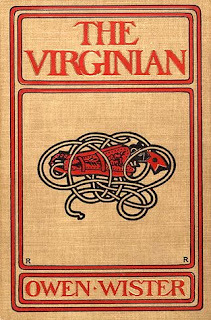 The Virginian TV series was unique in the fact it was filmed to be ninety minutes long, (seventy-five with commercial breaks). Running for nine years, it became the third longest running western series behind Bonanza and Gunsmoke. The show had many changes throughout it’s run, including the changes in the owner’s of Shiloh Ranch, but the main character, the Virginian, played by James Drury, remained the same. Drury starred in many TV shows and films, including a cameo appearance in the 2000 movie, The Virginian starring Bill Pullman. If you enjoyed the show, this is a fun website full of information-- http://www.thevirginian.net/. If you have the time and interest, I’d recommend reading the original novel, just because. A free download can be found here. This year marks the 100th anniversary of the National Parks system. And it all started in Yellowstone… with the US Army. However, there were problems. Lawmakers didn’t think that maintaining the park would cost the government anything. The first superintendent, Nathaniel Langford, was unpaid in his position. He did what he could to protect wildlife and the natural features. Without money, he couldn’t hire anyone to enforce the laws within the park. Roads were constructed and a “gamekeeper” was hired to get rid of vandals and poachers. He was succeeded by three superintendents who were ineffective at protecting the park. Even with ten assistants, they could not properly police the park and couldn’t stop the destruction of wildlife. In 1886, Congress refused to appropriate money for Yellowstone. 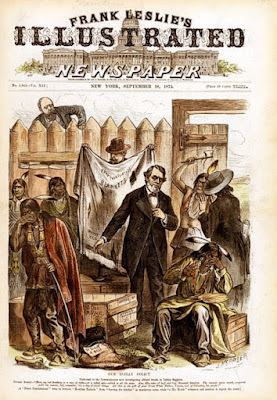 The Secretary of the Interior therefore called on the help from the Department of War. 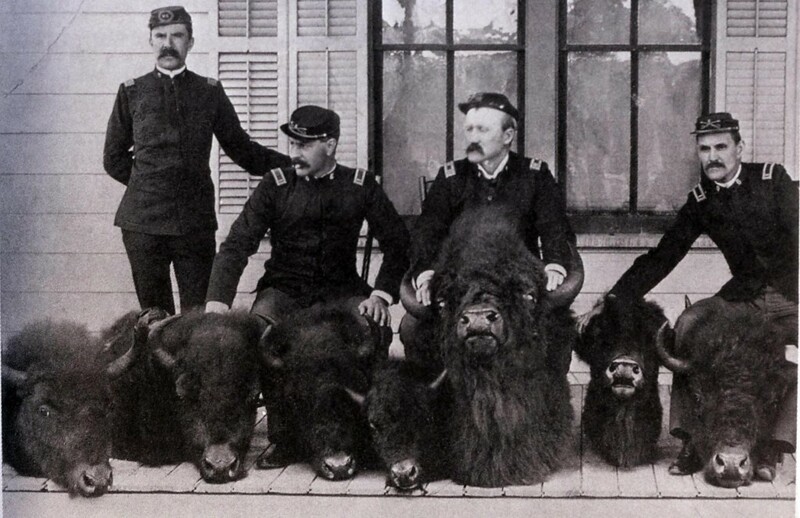 So on August 20, 1886, the US Army took control of Yellowstone. They didn’t expect to stay long, but they were so effective in keeping law and order in the park, that they remained for 30 years. 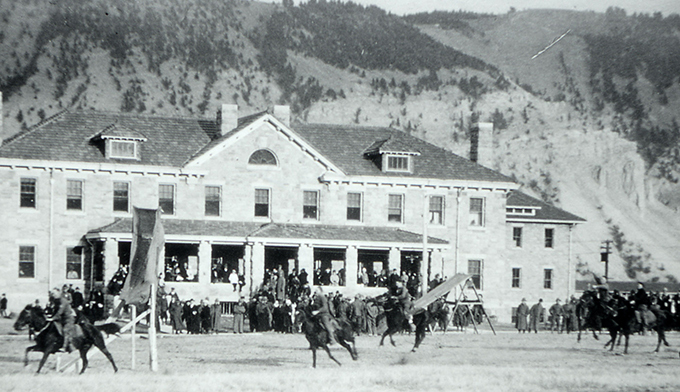 On May 11, 1891, the army received approval for a permanent base, and began constructing Fort Yellowstone inside the park. Prior to this date, the Army had operated out of Camp Sheridan, located at the base of the Mammoth Terraces. The army, comprised of Company M of the US cavalry, enforced regulations inside the Yellowstone Park boundaries, guarded the major attractions, patrolled the interior, and got rid of troublemakers. Their main role turned out to be apprehending poachers. Poachers slaughtered deer, elk, and bison, threatening their extermination. The maximum punishment at the time for poachers was eviction and banishment from the park. In 1894, the cavalry arrested one persistent poacher, Ed Howell for killing bison when there were only several dozen left in the park. A journalist was present at the arrest, and sent a report and photographs to his newspaper in the east. 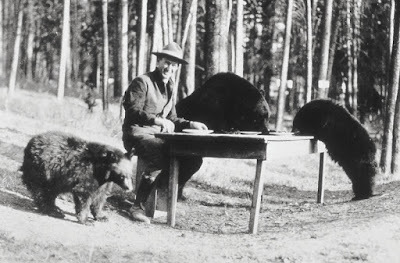 His story created a national outcry, and within two months, Congress passed the Lacey Act, giving the army greater authority for protecting animals and features in the park. While the army was great at protecting the park, they couldn’t do much when it came to answering visitor questions about the area. Furthermore, 12 other national parks had since been established in the US, all under different administration. Finally, on August 25, 1916, Woodrow Wilson signed the National Park Service Organic Act, creating an agency that would manage all national parks. 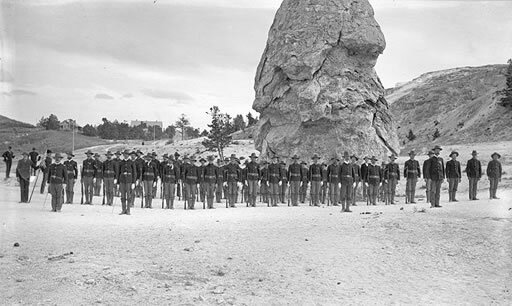 The first national park rangers, many of whom were veterans of the army, took over in Yellowstone in 1918.